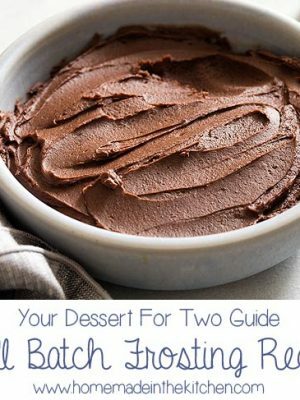 Looking for a small batch gluten free Thanksgiving dessert recipe? 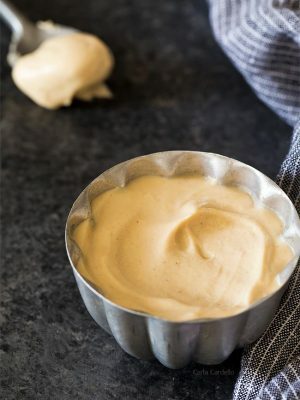 Whether you’re baking for one or two people, this easy crustless Eggless Pumpkin Pie For Two recipe is baked in ramekins so you can have your pie without leftovers. 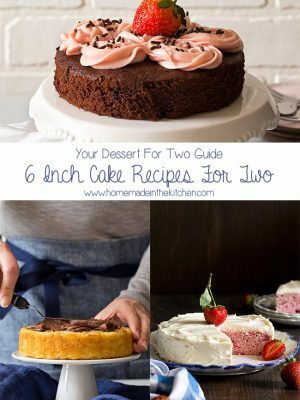 Small batch baking and dessert for two recipes are something I know well because of experience. Truth is I’ve been cooking for myself since 2007 (minus when my parents and brother visit). I never thought much of it until I was at my first big girl job after college from 2010-2014 where everyone who worked there had a family to feed. Coworkers mentioned to me time and again about how they couldn’t do what I do, how they couldn’t make mashed potatoes for one person and would get bored with too many leftovers (not to mention they thought I drove 2.5 hours home to my parents every single weekend like I’m back in college). Funny how lifestyles can vary so much. I may have felt alone at my previous job, but I know you’re reading this right now because you, too, bake for 1-2 people. Sure, Thanksgiving is about family get togethers, but the thing is not everyone has a huge family. Or perhaps travel plans didn’t work out this year and not everybody will be eating holiday dinner together. 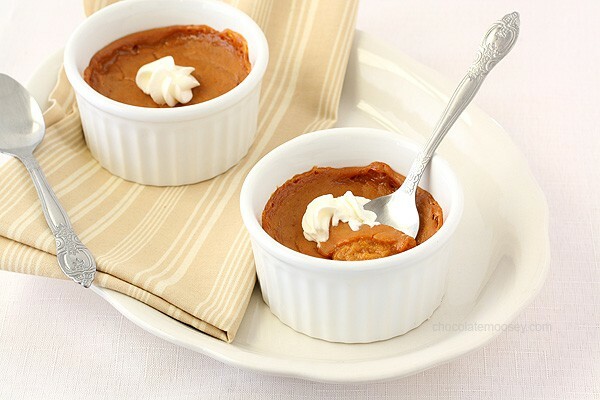 Whatever the reason, I got you covered with mini Eggless Pumpkin Pie For Two baked in ramekins. I cut down traditional pumpkin pie filling into two servings, substituted cornstarch for the egg, and skipped the pie crust. It’s no secret homemade pumpkin pie is often synonymous with Thanksgiving. 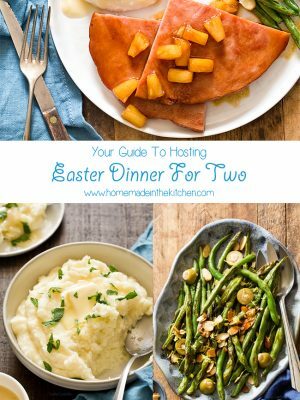 If you need help planning your holiday meal this year, check out my Thanksgiving Dinner For Two Dinner Menu. I was debating on whether I could even officially call these pies because there is no pie crust involved. However, the pumpkin pie filling is the same, so I’m calling them crustless mini pies. Because this pumpkin pie is crustless, it is also gluten free. Of course if you’re missing the crust, mix together 1/4 cup graham cracker crumbs with 1 tablespoon melted butter. 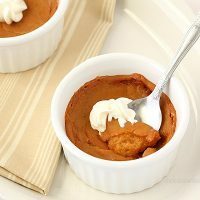 What can I use instead of eggs for pumpkin pie? Traditionally pumpkin pie contains eggs. However, I was making such a small batch, I had to find a way to make an eggless filling. That’s where cornstarch comes into play. 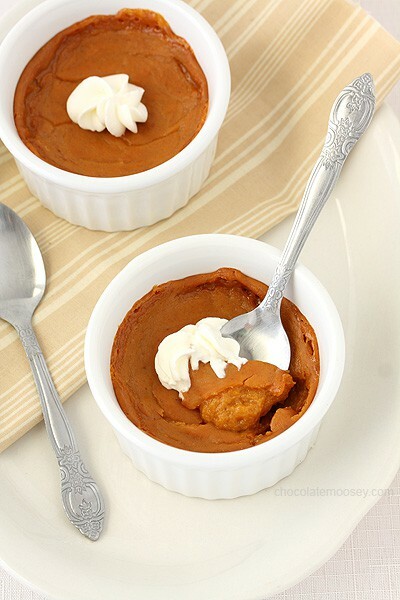 Used as a thickener, you still get the consistency of pumpkin pie without having to cut an egg in half. Who has time for half an egg, anyway? 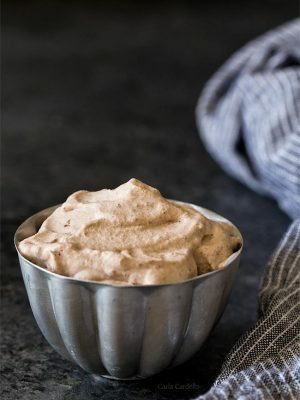 Looking for a small batch gluten free Thanksgiving dessert recipe? 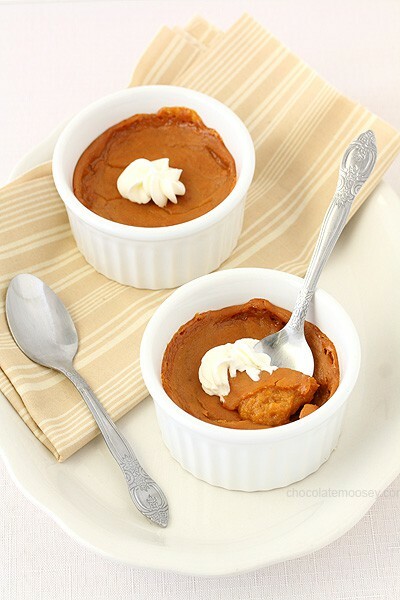 This easy crustless Eggless Pumpkin Pie For Two recipe is baked in ramekins so you can have your pie without leftovers. Preheat oven to 350F. Have two ramekins ready. In a medium saucepan, whisk together the pumpkin, sugar, cinnamon, nutmeg, ginger, milk, and cornstarch. Bring to a boil. Boil until the mixture thickens, stirring often, about 3-5 minutes. Divide the mixture between the two ramekins. Bake 30-35 minutes or until a toothpick comes out clean. Cool completely before serving with whipped cream. 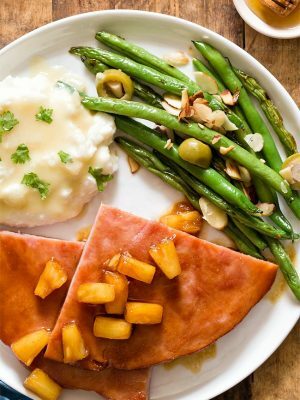 Yay for smaller Thanksgiving recipes! As much as I WANT to eat an entire pie by myself, I certainly don’t need to so thank you for coming up with a 2 person recipe! No crust, no problem! Just scoop it up with cookies! I’m brilliant, no? You, my friend, are a genius. Why didn’t I think of that?! Thank you so much for the recipe. I have a gluten free, egg free child who really wants a pumpkin pie. 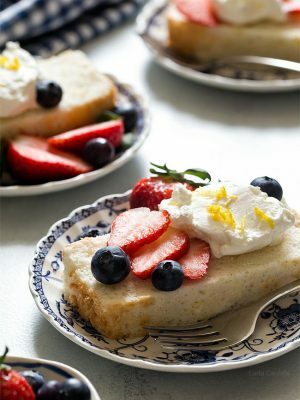 Food allergies are hard on a kid but this recipe may just make it a little easier. Thanks!!! This looks perfect for me to make for my daughter who is allergic to eggs, milk and peanuts. I’m going to try to make these for her for Christmas. I hope the 1/3 cup of evaporated milk can be easily replaced with 1/3 cup of almond milk. I will let you know if it still cooks properly. This will be a lifesavor for me if it works. I never know what to make for her to eat for dessert since she is allergic to so many things that are in all holiday favorites. I’m not sure, but since it’s baked in a ramekin and not an actual pie, you don’t have to worry if it spreads too much (like a failed custard pie). I hope your daughter enjoys it! 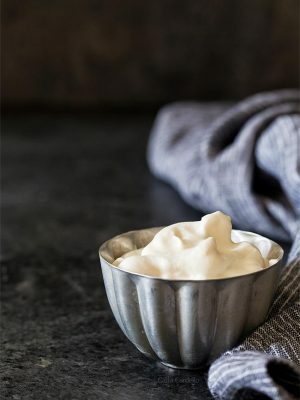 I am not familiar with sugar substitutes, but after some (quick) research (via http://skinnyms.com/10-alternatives-to-refined-sugar/), it sounds like you can use sucanat, turbinado sugar, or coconut palm sugar. However, I would do your own research and maybe even verify with your daughter’s doctor first before proceeding. 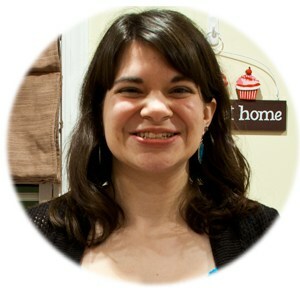 Your picture looks like a deflated carrot soufflé (albeit yummily appealing). 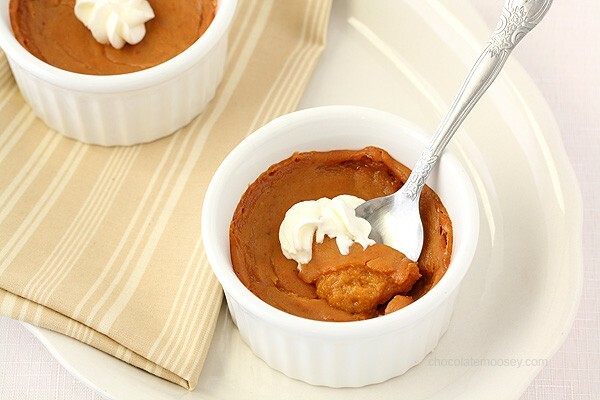 The best way to satisfy that pumpkin pie craving without the guilt! Great for us allergy sufferers too. Yes, it’s the perfect recipe for those who have allergies but still want to enjoy pumpkin pie. This is a brilliant idea for portion control. What a wonderful recipe. It’s one I will make often. Thank you!! 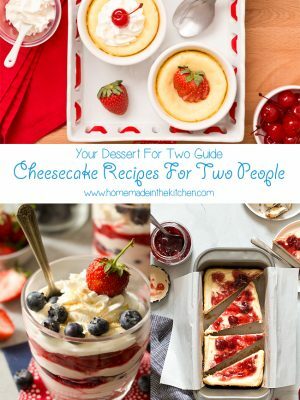 Yes, recipes for two can often help with portion control as well. Let me know how you like it!